Pordenone, Italy: A student of mine recently referred to silent films as “movies without speaking”. When I screened two silents in two consecutive weeks, his classmates groaned, “Another primitive one? Another one without speaking?” It is not that the students are wrong in their definition (silent films are indeed not talkies), but their disdain for older films and difficulty in accessing the “newness” of past innovations betrays the widening gap between cinema’s birth and its more recent incarnations. The same is true of today’s viewing contexts. How can a movie theatre with plush red seats and 35mm projection appear anything but antiquated in the eyes of a generation that records moving images on cell phones, carries video clips on iPods, and rips and burns its way into whichever film histories are unavailable on YouTube? Yet, with so many images just a trackpad and mouseclick away, a visit to the cinema to see a whole film or, even better, “a movie without speaking” acquires a new novelty. The Pordenone Silent Film Festival, known in that Northern Italian town as Le Giornate del Cinema Muto, is a week-long, multigenerational deliberation over the future of cinema’s past. From aging silent child stars such as Jean Darling and Baby Peggy to film’s independent and academic scholars to archivists and DVD companies, the festival participants trace a path from lived memory to the latest technologies of preservation. At stake are the fragile, surviving prints of cinema’s first decades. Lost from public discourse and from public view, they are found in archival vaults and refurbished for a new audience, albeit a select one. This spectatorial avant-garde both scrutinises every shot, every inch of the frame, in search of clues that would confirm or debunk existing stylistic histories and surrenders to a cinephilic delight in seeing the unseen or, rather, re-seeing the once seen. For this reason, even a weak festival program – as the 2008 Giornate was – is never really a failure. While it is nearly impossible to top the 2001 train ride to Udine for the BFI restoration of Abel Gance’s Napoleon (1927) or the 2004 Dziga Vertov retrospective, this year’s subdued selections allowed for more contemplation than hype. Away from the clashing cymbals of the world’s first auteurs, festival-goers’ collective rediscovery could be that of noticing more. Poised between the festival’s two forms of return – a desire to recreate the original viewing circumstances and the inescapable realisation of the time elapsed between the images onscreen and our own lives – the films are neither just themselves (then) nor simply events in our perception (now). They are, rather, the fusion of the very old and the very new, and we are always watching ourselves watch them. In the category of Cinema delle Origini, the festival showcases the short films and fragments that, in their early experimentation with the medium, reveal cinema’s moment of becoming. This year’s Edison shorts included W.K.L. Dickson’s initial cylinder experiments for the Kinetoscope, a box-like projection system for peephole viewing. Photographed in 1889-90, the films are mere seconds long. While the motion of the human body is apparent, the blurred images hide the exact nature of the actions they make visible. The distortions of the cylindrical recording apparatus thus seem to trade the accuracy of representation for motion itself. The unfocused mass moves, and we spectators back from the future stare in awe at its inability to communicate with us, at our inability to interpret it. The moving object is not yet something, but it is also already everything. Its motion is all potential: the potential of science to overcome a technical obstacle; the potential of moving images to move thought; and the potential of viewers to see beyond surfaces. Elsewhere in the early cinema program, surprises came at unexpected sights or feats of particular sophistication. 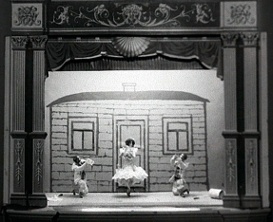 The French film Toto exploite la curiosité (1909) provided a variation on earlier films about the act of viewing. Rather than motivating shot transitions and framing through the narrative use of a magnifying glass, the film hinges upon the unique visions of a kaleidoscope. Walking through busy city streets – a spectacle in themselves – Toto comes across this device and manages to incite the curiosity of the urban crowds. The act of kaleidoscopic looking grows more and more abstract as buses, electric trams and thronging masses give way to shifting coloured shapes. Even the police who arrive on the scene cannot resist the temptation to peer through Toto’s glass. It is as if this little film about cinema wants to upstage urban life, or “real” life, with the claim that there is always something more to see through a lens. In the fragment of Charles Urban’s Living London (1904), that “more-to-see” was the city itself. The surviving eleven minutes of this 40-minute film convey such a density of urban information that it is hard to believe the film predates Walter Ruttmann’s Berlin: Die Sinfonie der Grosstadt (Berlin: Symphony of a City, 1927) and Dziga Vertov’s Chelovek s kino-apparatom (Man with a Movie Camera, 1929) by more than two decades. Advertisements, horse-drawn busses and pedestrians crowd the frame as the film showcases the various activities and locations of London life: commerce (marketplaces) and politics (Big Ben). A phantom ride along the Thames functions more as an integrated tracking shot than an isolated view as the film takes on the entire city and must find ways to link disparate categories of images. As with any film fragment, one takes the part for the whole. Living London’s anticipation of more complex editing patterns and city portraits is all the more innovative for the images we do not see. A weak festival also has the advantage of throwing individual features into greater relief. In the 12th installment of The Griffith Project, a multi-year comprehensive retrospective of D.W. Griffith’s oeuvre, the Giornate has arrived at such mature silents as The Sorrows of Satan (1926) and Lady of the Pavements (1929), both of which display Hollywood’s fascination with German technique. 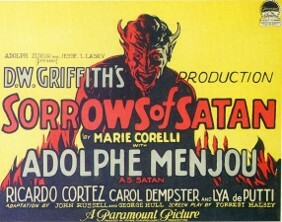 The Faustian themes in the first film result in a poor writer’s sale of his soul to Prince Lucio (played by Adolph Menjou). Seduced by wealth and fame, the young man forgets his fiancée, his link to pure love and goodness. Like its literary and filmic precedents – for example, the novella Peter Schlemihl’s Remarkable Story and film Der Student von Prag (The Student of Prague, Stellan Rye and Paul Wegener, 1913) – The Sorrows of Satan attempts to give form to the devil’s lure. Griffith’s use of chiaroscuro, the expressive lighting favoured by Fritz Lang and F.W. Murnau at the time, culminates in a metaphorical play of light and shadow in which the young writer tries in vain to evade Lucio’s approach. In Lady of the Pavements it is the cinematography more so than the mise-en-scène that recalls the cinema of Weimar Germany. In this tale of romantic vengeance, a German diplomat declares to his unfaithful Parisian fiancée that he would rather marry a woman from the streets than a promiscuous aristocrat. His thwarted girlfriend then plots to link him to a working-class singer disguised as a lady. Throughout the film, a mobile camera – the German entfesselte Kamera – compensates for weakness of plot and character. Two other films set in Paris – Nicolas Rimsky and Pière Colombier’s Paris en cinq jours (1925) and Jacques Feyder’s Gribiche (1926) – explored the city from unusual perspectives. The first follows the adventures of a drunken American tourist who gets lost in the French capital. A subjective camera and quick cuts render his perception of the swirling metropolis and, upon his return to New York, a series of comical flashbacks interrupt his sober retelling of the vacation. In Gribiche, the eponymous child hero could be a prototype for François Truffaut’s Antoine Doinel (“Gribiche” is indeed a nickname for the character Antoine Belot). As a reward for a kindness to a wealthy lady, Gribiche (Jean Forest) is invited to become her ward. Afraid of being an obstacle to his mother’s remarriage, he agrees to leave home. Ultimately his longing for the pleasures of childhood and the warmth of his mother’s love trump the advantages of a privileged upbringing. In a sequence that seems to foretell of Doinel’s nocturnal wanderings through the Paris of Les Quatre cents coups (The 400 Blows, 1959), Gribiche runs away from his patron’s villa to the Bastille Day celebrations. At another moment, lost and vulnerable, he drinks directly from a public water pump (Doinel’s milk bottles), and finally, he arrives at his mother’s apartment. Like that of the young Jean-Pierre Léaud, Jean Forest’s face registers the subtle shifts of a child’s moods and reactions. Already in Feyder’s film, Paris is the location of adolescent accommodation with the adult world. The greatest feature-length find at the 2008 Giornate was, however, Danish-German director George Schnéevoigt’s Norwegian epic Laila (1929). Introducing continental cinematography to the weather conditions and topography of Northern Scandinavia, the three-hour film follows the fate of Laila (Mona Martenson), a Norwegian lost in the tundra as a baby and raised by nomadic Sámi. As Laila matures, she is caught between nature and nurture, her Norwegian cousin Anders (Harald Schweinzen) and her Sámi foster brother Mellet (Henry Gleditsch). Not only does the film provide a nuanced portrayal of Sámi-Norwegian tensions and the complex loyalties of heart and hearth, it does so with stunning cinematography. In the scene of Laila’s inadvertent abandonment, her parents and nurse flee a pack of wolves. Schnéevoigt, who had previously worked as a cinematographer for Carl Theodor Dreyer, renders the chase across the white landscape with dramatic framing and accelerated cuts between the menacing wolves and the family’s dogsleds. In several shots the camera is mounted on a sled or mobile device as snow flies past the lens. Natural light and wind as well as the physical dexterity of the shooting and the stunts create a realist suspense that culminates with the nurse’s release of the baby’s basket. Though the film was projected for years at the wrong speed, Laila’s restored form adjusts the film’s pace for projection at 24 frames per second. With its temporal dimension reinstated, the film demonstrates a mastery of both emotion and action. One area in which the festival rarely suffers is its resurrection of unusual uses of the cinema. In recent years, the animation of Winsor McKay and Ladislas Starewitch as well as early flight and nature films prompted a collective fascination with the visions made possible by cinematographic technology. This year it was the choreographed puppet dances, paper films and home movies of Russian ballet master and character dancer Alexander Shiryaev that expanded early cinema’s repertoire. Breaking dance moves into successive sketches, he would reconstitute motion on a home projection device. Gradually he began using a 17.5mm camera to record elaborately staged puppet ballets as well as to make experimental films, often starring family and friends. From simple but elegant forms pirouetting on paper to the blurred image of Olympic figure skater Nikolay Panin twirling on the ice to the nearly life-like antics of Pierrot puppets dancing across a proscenium, Shiryaev’s films return to cinema a delight in raw movement. In contrast, the festival’s focus on World War I newsreels appealed to the stillness that follows destruction. The mostly Austrian shorts shot between 1915 and 1918 concentrate on that country’s invasion of Northern Italy. In this confrontation of modern warfare and cinema, it is as though the camera operators were establishing a new arsenal of images. Rather than seeking out the celebrations of victors, the camera rests on the remnants of building façades, the gaping hole in a grand hotel, a park stripped of its trees, and the carcasses of dead horses. It lingers on the discarded objects and debris of the enemy with the same quiet restraint with which it greets a trove of requisitioned weapons. War is revealed to be an exchange of inspections; one army coolly surveys the damage wreaked upon the civilian population and defenses of the other. The images resist gloating as intertitles matter-of-factly name the places of battle, the actions afoot, and the ruins left behind. At the same time, the depth, light and composition of individual shots suggests the inevitable aestheticisation of broken cities and towns, civilians and soldiers. It is difficult in watching these films – cinema’s conscription into human violence – not to think of later collaborations between cinema and war. These films, which only begin to make sense of destroyed landscapes, are eerie precursors to the televised wars that are now and to the mass circulation of World War II imagery. In one of those profound Pordenone moments, old images become new again because they do new work and make us see the past and the present in new ways. In an audience of Northern Italian locals and German-speaking archivists, murmers of realisation rose above the live piano accompaniment in the Ridotto, the smaller of the festival’s two theatres. On a human scale, the viewers were revisiting the experiences of great-grandparents, grandparents and, for some, even parents. We sat there, the last of the generations who might have known someone who knew someone in those images, on that precipice where memory slips into history and where first-hand knowledge becomes the cinematic record. By the end of the Giornate, hardened cineastes learn to “see” again. To my students who complain of “movies without speaking”, I can only recommend a week of total immersion in these visions of the past. After recalibrating their expectations, perhaps they, too, would hear with their eyes what it is that these films do speak.